Cars 3 is now out on DVD and it didn’t take long for Bella to want to watch it over and over again. She has a love for cars thanks to her dad. Bella will sit and watch F1 Racing with her dad on the weekends and can spot the Ferrari symbol anywhere! I am kind of glad my girl is into cars and Disney’s Cars. She has quite the collection of cars and can often be heard racing them down the hallway. She may have even claimed one of her dads Ferrari models … which she broke – sorry babe! I know she will love the movie and it will be a great daddy/daughter date so mom can kick back and relax this weekend. 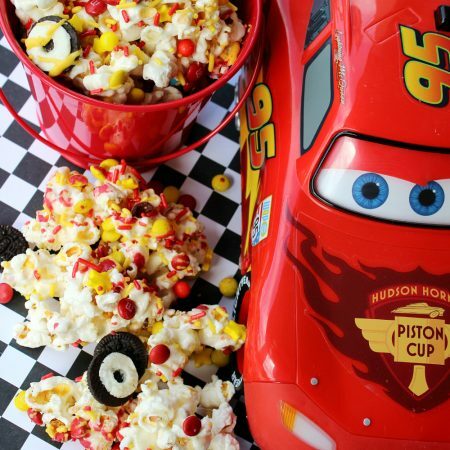 Plan a fun movie night in with the family and enjoy this Ka-Chow Cars 3 Popcorn. Everyone will love this sweet and fun mix! Watch those lightning fast and funny cars while munching on this incredible snack! 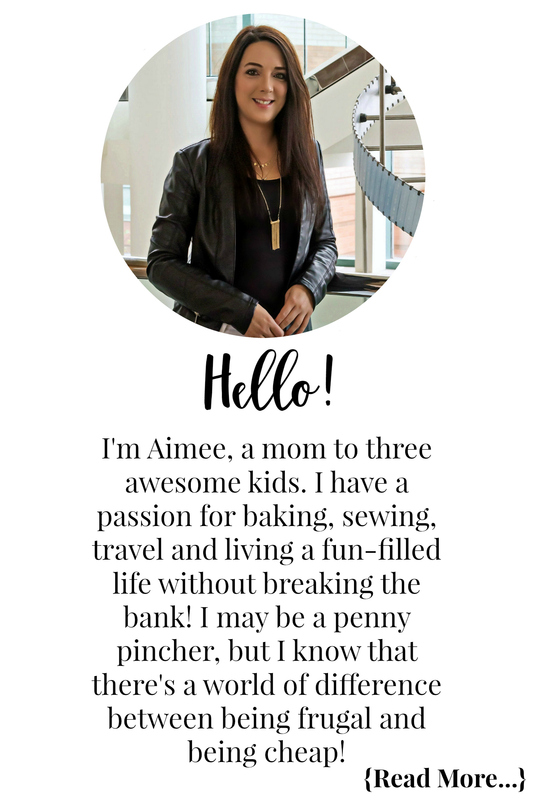 Feel free to double the recipe or cut it in half to suit your family’s needs. In a microwave safe dish melt the marshmallows and butter together in 30 second intervals until melted. You will use 1 tbsp of butter for each 1 cup of marshmallows you use. Once your marshmallow and butter mixture has melted pour it over your popcorn and stir until evenly coated. Lay the popcorn and marshmallow mix on a wax paper covered cookie sheet. Add on your M&M’s and sprinkles while your popcorn is still wet. Mix the M&M’s and sprinkles so they are evenly distributed. Take apart your mini Oreos carefully so that the cream stays on one side. Using a straw, remove the cream from the center of the Oreos to create a tire, then add them to your popcorn. In a microwave safe dish melt your white chocolate in 15-30 second intervals until melted. Place half of the melted white chocolate into a separate dish. Using food colouring, dye one dish red, and the other yellow. TIP: If your melted white chocolate seizes up, add in a tablespoon of melted coconut oil or vegetable shortening to thin it down. Next, drizzle the melted white chocolate evenly over your popcorn mixture. Let set for 10-15 minutes, and enjoy your Ka-Chow Cars 3 Popcorn! I also have an amazing Minions popcorn recipe you should check out too! Who is your little ones favourite character? Let me know in the comment section below! This looks amazing and so fun! 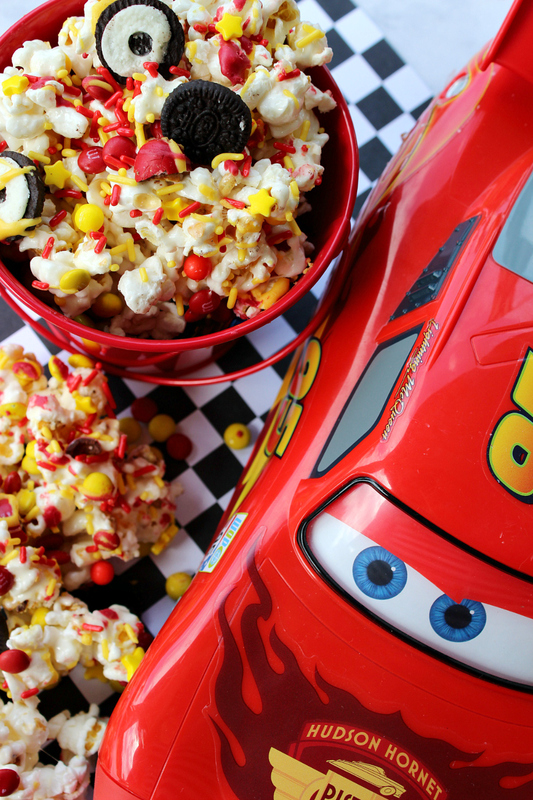 This looks very tasty and such a fun way to make popcorn, perfect for a Cars theme party!! I love the theme and so would kids but mostly I love how you’ve put all matter of snacks in with the popcorn. Yummy !